Elders can remain in Fort Chipewyan for assisted living and palliative care, thanks to support from the provincial government. Minister Feehan, Chief Waquan, council and community members take part in the Kahkiyow Keykanow Elders Care Home announcement. Over the next three years, the Kahkiyow Keykanow Elders Care Home, the only assisted living facility in the isolated community of Fort Chipewyan, will receive $1.5 million for operating costs. The $12.2-million, 12-space facility, which opened in 2014, was built with funds from the Mikisew Cree First Nation and industry. The home serves elders from Mikisew as well as the Athabasca Chipewyan First Nation and the Métis community in Fort Chipewyan. 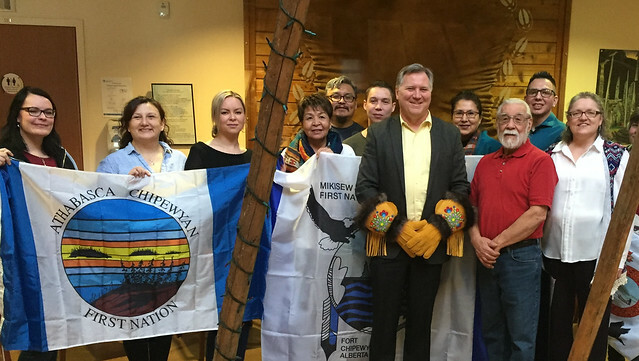 The funding corrects a longstanding disagreement over funding for Fort Chipewyan. In 2005, the province committed $1.79 million towards supportive living in Fort Chipewyan, but never allocated it for a specific project.